What types of things should I be putting for the Focus Keyword when I’m using the Yoast SEO plugin? This question refers to the WordPress SEO by Yoast plugin. What do focus keywords do? First of all, I’d like to point out that the focus keyword doesn’t actually affect your SEO. This keyword spot is put in to help you judge how well your post is optimized for a specific keyword. So when you write a post, you have to pick a keyword(s) that you want to target. So, to use this post as an example, I might pick focus keywords as my focus keyword (haha!). Those keywords are meaningful and they strongly relate to the post I’m talking about. 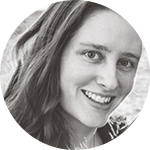 Ultimately, you want to pick keywords that are short, sweet, and relate to what you’re talking about. Think about some keywords that people would include in searches that relate to your post. So of you’re reviewing Allegiant by Veronica Roth, your keyword might be “Allegiant”. When you put in the focus keyword, the plugin calculates how well your post is optimized for that keyword. If you look at the Page Analysis tab, it will tell you things like how often the keyword was used throughout the page, whether or not it appeared in image alt text, etc. The rating can be green (good), yellow (okay), or red (bad). For the full breakdown, be sure to check out the Page Analysis tab. That will give you tips on how your SEO can be further improved. Ummm, yeah, you lost me. lol. Oh no D: At which part? Nothing in particular, I just started reading and then my brain went jumbled. I will have to read this when I can use it or else it’s hard to relate it to something I don’t have yet. I’ve downloaded the WordPress SEO by Yoast a while back, and never quite understood it… You’ve definitely broken it down well. So what I got from it is that the plug-in basically helps you see how good your SEO is for a particular key word. 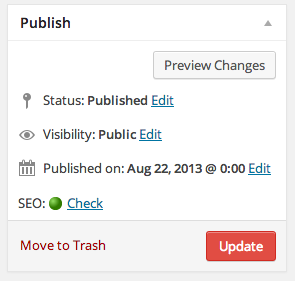 Then based on ratings (red, yellow, green), you make decisions on how to change your post, post title, etc. in order to get to that green SEO rating. Nice. I think I’m still definitely a beginner on this whole SEO thing, but at least now I have a better understanding of how to use the plug-in to help me. Yep that’s the gist of it! 😀 The plugin also includes a ton of other settings to help improve your SEO, but in this post I mainly focused on the “focus keyword” aspect of it, which is what you see when you make individual posts. WordPress SEO by Yoast is without question the BEST SEO plugin for WordPress available at no charge (my favorite price). I practice SEO and insist that any and all WP websites install it before I’ll work with them. I love all the microcontrol over scripts, what gets noindexed, what is included in the XML sitemap, and the more geeky stuff. My clients love the WYSIWYG extension that allows for the focus keyword as you reviewed above. If you want to self-generate SEO-friendly content, this is the best way to do it. Let me know if you need other resources on how to manage it, because I’ve likely found all the good ones. Thank you. Really useful and much more clear than the official article on Yoast Website. Finally. Someone explained that whole Yoast focus keywords in simple, understandable terms that make sense. Whew! Thank you, thank you, thank you. Rosemond recently posted: The Christmas Countdown. Stop pushing me, I have a Holiday hangover. Am using same seo by yoast plugin but there are many competetors with some keywords. Should i use comma to seperate keywords?? I’ve been struggling a lot in determining the correct focus keywords for my blog posts. Thanks for this great post! Regina Foo recently posted: Merry Christmas! Good post. The proofs in the eating as I Googled for this and your post was found. I’m moving from All In One SEO to Yoast, thanks for the advise. 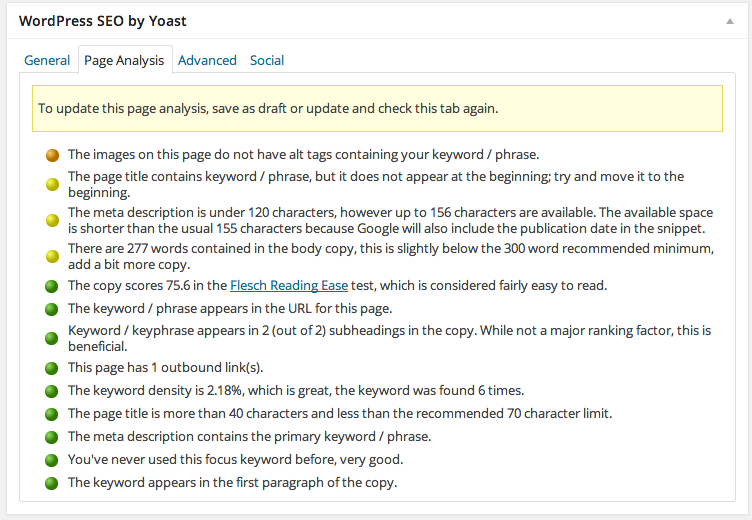 Yoast’s SEO Plugin is simply unbeatable, I love it. I’ve never actually used the keyword stuff in it, though! I’ve never really paid much attention to the focus keywords section. It up for debate what the best keyword density is so I don’t particularly like to go by what yoast says is best. Interesting article all the same! Yoast is pretty good but I prefer to run it in ‘manual’, adding my own meta tags which I keep track of on a spreadsheet. Clearly this is difficult for large news sites or online stores, but where I can I overwrite so I have control over the snippet result. I have also started adding schema.org code with the Add to Page Head plugin … with some fantastic results. Hi Ashley, yes I agree. I was using All in One for some sites but changed them to yoast. Yoast is way better and simpler for inner page titles and things like that, although I don’t use the keyword parts of it myself.